This is the first of the two-part series on the impact of technology on cities. This post also appeared on Sidewalk Lab's Medium page. I’ve always thought of myself as an urbanist. I’ve studied urban history. I’ve been an official at a big city government. I’ve helped lead a global organization of mayors. So it’s a little surprising that today I find myself part of a technology firm, Sidewalk Labs. Our mission at Sidewalk is to develop technology that makes urban life better, in part by bridging the gap between technologists and urbanists. Our CEO Dan Doctoroff likes to point out that urbanists and technologist don’t speak the same language. So often when I walk into my office I feel like a stranger in a strange land. But I am learning to speak technology — slowly. One thing I’ve learned along the way is that technologists love to approach problems from first principles, focusing on essentials rather than on existing practice. Silicon Valley didn’t invent this approach; Plato used it. And of course first principles don’t, on their own, indicate how to arrive at some future state; the task of getting stuff done in the world as it exists — with institutions, stakeholders, infrastructure, and path dependencies — is one way that urbanists can add value to technologists. Will autonomous vehicles lead to super-commuting and massive sprawl, or will they enable ride-sharing to replace the private automobile? Could robotic construction make housing cheaper? Will virtual reality make cities unnecessary? One challenge we face in answering these questions is that some of the factors that historically have helped us explain cities no longer hold true. Transportation costs, knowledge and communication clusters, and increased specialization have been longstanding reasons that people gravitated towards cities. But these factors don’t carry the same explanatory power they once did thanks to advances like cheap shipping, smartphones, and digital connectivity. Similarly, we can’t rely on arguments for cities that are only true today because of current technology or institutions. We know cities are good for the environment. On a per-capita basis, urbanites create fewer greenhouse gases than people who live in suburban settings. But widespread solar power and electric vehicles could tip the balance at some point to favor suburban areas, because it’s easier for a single-family home to generate its own electricity with solar panels than for a large apartment building. So while cities are a clear path to sustainability right now, that may not hold true forever. Finally, we have to be very careful not to mistake our preferences for intrinsic values. I like cities. But that’s a preference. So is the fact that someone else wants a backyard or a pool and a one-acre lot. Human tastes change, and they often change in response to what technology makes available. So, if we have any hope of guessing how technology will change cities — and of shaping that change with good policy and planning — we need to strip away our historical understandings, our focus on existing technology, and our personal preferences. In short, we need to get to first principles. And that requires looking first at the essential elements of a city: people and space. Fundamentally, a city is a dense settlement of people. The definitions vary, of course, but when enough people live clustered together, and that space hosts multiple activities including work and commerce, we can see a city. That doesn’t have to be Manhattan or Hong Kong. It could be Old Town Alexandria, Virginia, or downtown Palo Alto, California; call it 8,000 to 10,000 people per square mile. But it is density that is the essence of a city. And density has a very big implication: each person uses less space. In some ways, that is a silly thing to say. It’s the definition of density. But its implication is profound: When technology makes density more valuable, cities will be more attractive. When technology makes density less valuable, cities will be less attractive. Before we can evaluate what impact technology might have on urban life, we need to strip density down to its core elements. If we think about the effects of using less space per person, we reach three basic efficiencies that define cities: resource conservation, asset utilization, and physical interaction. These might sound overly technical, but they’re actually very intuitive, and they’re critical to understanding what form cities will take in the future. Resource conservation says that people in dense areas use fewer resources — energy, travel, time, goods — than people in less-dense areas. This efficiency stems directly from density because much of what we consume is driven not by our appetites but by the space we inhabit. 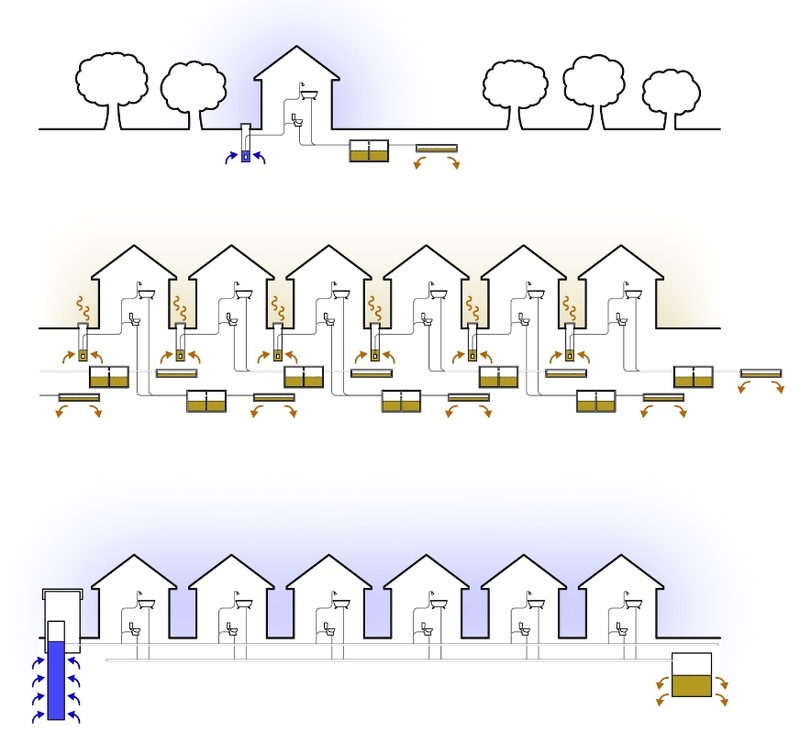 In cities, energy use declines because, per person, there’s less indoor space to heat, cool, and light. Water use declines because lush lawns, which account for half of all household consumption, don’t exist in cities. Solid waste declines as well, driven by the inability to store stuff, and the tendency to dine out more often; in New York State alone, residents of super urban areas (more than 50,000 people per square mile) waste 2.1 pounds a day, whereas people in suburban areas (less than 8,000) waste 3.8 pounds. Sidewalk Labs analysis of Hinsdale, Columbia University Earth Institute (2014) and NYC Planning Community Portal. Image courtesy Sidewalk Labs. Density also both enables and requires greater asset utilization, which is the simple idea that any one thing — be it a taxicab, a park, a dining table — gets used more often and by more people. We know this intuitively: Despite its size, New York’s Central Park is far more intensively used than anyone’s backyard. But asset utilization goes even deeper than that. The same length of water pipe can serve more people if homes are closely packed than if they’re spread out. This advantage holds for virtually all of our networked utilities: sewer pipes, electric wires, cellular phone towers, and the like. And many other types of assets are provided more by distance than by usage; every small town wants to have a library, even if it’s barely used much of the time. The final efficiency of urban density is the prevalence of physical interactions. We’ve long heard the idea that the internet would make cities unnecessary, but in fact, we’ve seen the opposite effect: the greater connectivity enabled by technology itself fosters new demand for face-to-face encounters — and even makes them more valuable. Blue Apron might replace the trip to the store to buy dinner ingredients, but it doesn’t replace the experience of dining at a nice restaurant. In many cases, it makes that experience more desirable. This benefit is particularly strong in the area where telecommunications rarely substitutes: unplanned interactions. We can turn our meetings into video conferences and our chit-chat into text messages, but we haven’t found a natural way to recreate the side conversation that yields a fresh insight or a new friendship. There’s a reason we always imagine big ideas sketched on cocktail napkins; not a lot of conference rooms have cocktail napkins. Getting people in the same place is a major differentiator. It is also a key reason that density seems to accelerate innovation, create stronger communities, and enable greater social mobility. The density efficiencies outlined above might be called “good” friction. But there’s plenty of bad friction that comes from packing lots of people into small spaces, too, including a reliance on central systems, a reliance on trust, and a need for coordination. These concepts are equally critical to forecasting how technology might change cities in the coming years. A reliance on central systems isn’t inherently bad, but because central systems must serve many people, the management of them is more complex than that of self-contained systems. Water is one example. In low-density areas, wells can supply water. But it’s not feasible to dig a well in urban areas, and even if you could, the demand is too high. That creates the need for a central system. It also leaves city residents without an alternative — you’re locked into that system — which in turn creates concerns around access and equity. If people don’t have choices, the competition that makes private enterprise work so well breaks down; that’s one reason that urban utilities are so heavily regulated, or operated by government. And because central systems tend to provide one standard of service, the entire spectrum of customers has to accept the same product. The same issues run across many systems: electricity, transit, and so forth. Low-density areas can get away with self-contained water systems, but dense urban areas need central ones, which require more complicated management structures. Image courtesy Sidewalk Labs. Centralized systems lead to a second urban friction: the reliance on courtesy and trust to make density work. The close personal proximity of urban environments means that everyone’s personal decisions are far more likely to impact other people, and vice versa, than in a low-density area. Some of this need comes from simple proximity: the backyard noise from a city townhouse is more likely to annoy a neighbor than if you each had a half-acre lot. In cities, buffer space is limited. This cost is also the human side of the high asset utilization — the sharing — that density enables. If I share a sidewalk or a park or a subway car with you, my ability to enjoy that experience is dependent on your behavior. If I don’t trust the people around me, or don’t respect your needs, we are unlikely to be able to share spaces well. If my dog messes up the sidewalk, or I break the park bench, or I spill a drink on the subway seat, that undermines your ability to use it. The final friction — in some ways, the greatest — is in the need for coordination that density imposes. In some cases, this need is simply about negotiating space: it requires more attention to drive down a narrow, crowded city street than it does to drive down a wide, empty rural road. One reason construction often costs more in an urban area is because builders have to operate in tight spaces without staging areas to streamline work. Once again, there’s less space in cities to buffer human activity. In other cases, this need has to do with the fact that each decision impacts lots of other people. When everything from issuing a single building permit to moving a bus stop affects a large population, it’s going to be far more difficult to reach a decision on anything. And these two issues compound each other: proximity raises the stakes of negotiations, and scale makes negotiation that much harder. Considered that way, it’s a wonder anyone gets anything done in cities at all. Taken together, I think of these as the first principles of density, and I find them to be a helpful way to think about what makes cities attractive or unattractive. For example, the argument that cities are more sustainable, first elaborated by David Owen and espoused by city leaders around the world, stems from the resource efficiencies of density. Asset utilization explains why so many new technologies — from cable TV to Uber — have arrived in cities first, and only later spread out into suburbs and rural areas. And Richard Florida’s idea of the creative class involves workers for whom personal interactions, especially unintended ones, yield outsized benefits. Similarly, coordination costs explain the fundamental challenge of why dense areas are so fraught with politics. Government seems far more present, far more involved in the daily life of a resident in a dense city than in a low-density suburb, and certainly than in a rural area. The simple fact that less coordination is needed helps us understand why it seems so often that less-dense areas have less government: they don’t need it to help negotiate tight spaces. These factors combined help explain the Jekyll-and-Hyde nature of cities. Yes, cities make things efficient, but they’re also home to terrible traffic congestion. Yes, cities have great levels of diversity and neighborhood cohesion, but they’re also where we see bitter community divisions and angry tribal politics. Yes, cities are remarkably productive, but they’re also expensive to build and maintain. As an urbanist, I hadn’t really thought this is where I would end up. It seems fairly basic, somewhat soulless, and highly theoretical. It also isn’t, at first glance, very insightful: of course density is both efficient and causes friction. We’ve known that forever. What’s significant about these factors, though, is that they can form a framework to help us evaluate how changes in technology might affect cities in a thoughtful and systematic way. In Part II of this post — and in my remarks at APA’s Policy and Advocacy Conference in Washington — I’ll use this framework to explore how past technologies have influenced American urban history, then to develop some thoughts on what new technologies will really do for — and to — our cities in the future. Top image: Density in Manhattan. Photo by Flickr user Mik Efford (CC BY-NC-ND 2.0). 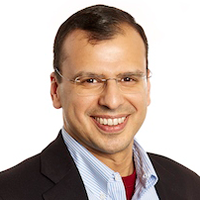 Rit Aggarwala is chief policy officer for Sidewalk Labs. Previously, he headed the sustainability practice at Bloomberg Associates, a philanthropic consulting firm that serves city governments. He is also an adjunct professor of International and Public Affairs at Columbia University, and co-chairs the Regional Plan Association’s Fourth Regional Plan for the New York metropolitan area. He is a keynote speaker at APA's 2016 Policy and Advocacy Conference.